Klara Wurtz was born in Budapest, Hungary in 1965. She began playing the piano when she was five. In the early seventies she became a member of the Hungarian Radio and Television Children's Choir. She was the accompanist of the choir and played music interludes in concerts during tours of Austria, Greece, Italy, Romania and Japan. At the age of 14, she was admitted to the Ferenc Liszt Music Academy. After her seventeenth birthday she studied with Zoltan Kocsis, Ferenc Rados, Gyorgy Kurtag and later with Andras Schiff in his masterclasses. In 1985 she won the Ettore Pozzoli piano competition in Milan not only for her technical skills but for her sensitivity. This is what is so special about Ms Wurtz. Her playing is very personal and yet never at variance with the composer's wishes. 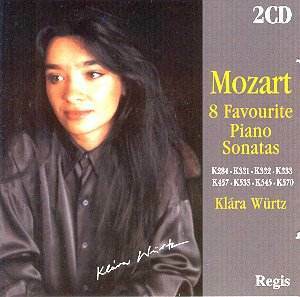 When you hear her play Mozart for example, it feels as if you have never heard it before. That's class. She was a prize winner in the International Piano Competition in Dublin where she performed Schubert's rambling B flat Sonata D960. In 1989 she passed with distinction her performing artist final examination at the Ferenc Liszt Academy. In 1991 she signed up with Columbia Artists Management in New York and has performed well over a hundred concerts in North America. She has had many successful performances through Europe. Her successes include many recordings for French, American, Hungarian and Dutch radio and television. In 1997 she formed a duo with the violinist Timora Rosler and they became prizewinners at the International Chamber Music Competition in Caltanisetta. She has recorded piano music by Bartók on the Globe label (GLO5111), on the STH label (19026 order ) music by Schubert, on Column Classics (0122) the glorious Beethoven Piano Quintet op.16 and Mozart's K452 and on Quartz Classics music by Schumann, Beethoven, Janacek and Webern with the cellist, Judith Jamin. A new complete Schubert piano music set is about to be released (Brilliant Box Dutch catalogue number 99672) in which she features new recordings along with Dutch performers in a 11 CD set. She has also recorded some Schumann including Kreisleriana, the C major Fantasy, not yet released. The producer, Peter van Winkel has already praised these performances as "the best so far... world class"
There is a wonderful story, which several people have confirmed as true, when Ms Wurtz appeared recently in a concert with one of her tutors, Andras Schiff and received the best reviews of the evening which caused him to have a terrible huff! I understand that Klara is appearing with the Auer Quartet in a concert at the Hungarian Embassy in London on May 4th this year. I could discuss at the length the sonatas on this double album. I have reviewed Mozart sonatas many times and play them myself. Technically they may not be exacting but they are very difficult to bring off. They require a musician who considers all the dilemmas, one of which is the right tempi. Klara is simply brilliant at this. Her choice of tempi is absolutely spot on. The F major sonata known as number 15 can be a real drag and sound both so facile and banal but at this expertly judged speed it sparkles with a wonderful vivacity. The C major, K545, often stupidly referred to as 'easy', is here very profound yet it also sparkles and the fingerwork is so reliable. The B flat sonata, K570 is a simply glorious work. How often it has been played with such correctness and an anaemic style and with dragging tempi. Not here, and the superb slow movement, in glorious E flat major, is a real treat. Everyone should play Mozart with such enthusiasm which makes the music live. I also have to say that with the music in front of me I could but only admire her playing, commitment and technical skill. But there were also moments of stunning revelation, which when you have known these sonatas for over 40 years, as I have, comes as an astonishing and amazing surprise. These are performances that eclipse all others. I have literally revelled in them. The praise Ms Wurtz has received from the press in various parts of the world has been laudatory and well deserved. I can testify to that without reservation or demur. What a bargain! What performances! What insight! Here is that rare joy! Mozart played with life, vibrancy and sheer excitement along with an exquisiteness that is so beautiful and rare that I do not know what to say. It would be a mistake for genuine music lovers not to buy this set.